Dancing With the Big Boys. Dancing With the Big Boys (extended 12″ mix). Dancing With the Big Boys (live, 1987). Iggy Pop was at the Tonight sessions for about a week. Not enough time, the producer Hugh Padgham regretted, as Pop’s presence seemed to shake Bowie’s indifference to his own record. Along with sitting in on some of Bowie’s embalmings of his old songs, Pop also worked up some new material with Bowie, little of which was developed (a number of songs from Blah Blah Blah came out of these sessions, though). But at one point Pop got Bowie into the vocal booth for some free-styling. The two faced off, drank beer, began calling out lines to each other. They went at it for about eight hours while Padgham taped it all. If there’s ever a Selected Aphorisms of Iggy Pop published, some of these lines would make the cut: Where there’s trouble, there’s poetry. Death to the trees. Nothing is embarrassing. There are too many people, too much belief. Your family is a football team. * Bowie later said it was a chance to burn through a stockpile of discarded lyrics. The underlying theme was a “little guy” overwhelmed by society, and perhaps there’s a Cold War satire buried somewhere in it, but it’s mainly just two old friends trying to trump each other. The resulting track, “Dancing With the Big Boys,” was the closest that Tonight ventured to spontaneity: a honking, barely-melodic album filler, with Bowie and Pop chants set against the band mainly staying on an augmented A chord** (there’s a move to D major on every fourth bar, adding a slight bit of tension quickly released by the return to A). Carlos Alomar contributed something (I’m assuming the various guitar riffs that serve as a counterpart to the Pop and Bowie vocals), as he’s co-credited along with Bowie and Pop. The obvious precedent was Pop’s “Fall in Love With Me,” another album closer/filler, another vocal booth improvisation over a static harmony. But “Fall in Love With Me” felt primal, the band seeming to take cues from Pop’s flights of thought, the song slowly growing out of itself. Had “Big Boys” just been Omar Hakim’s drums, Carmine Rojas’ bass and Alomar’s guitar, it might’ve worked as an update—Bowie and Pop’s first attempt at rap, even. Or had Bowie and Padgham gone full-out Art of Noise and stuffed the track with booms, clatters, shrieks and honks, “Big Boys” could’ve at least been a piece of its time. (This happened when Arthur Baker remixed “Big Boys” for the 12″ single, a version I enjoy more.) But there was a loss of nerve somewhere, as the backing singers appear to cheese things up, as do the Borneo horns, and while there’s some fine 1984-vintage jiggery-pokery, like the bass-deepening distortion (similar to Yello’s “Oh Yeah”) occasionally used on the title phrase, there’s far more typical Tonight glitz production overkill. Still, “Big Boys,” even in its compromised state on the LP, had a vitality that much of Tonight lacked. Bowie realized this, telling Charles Shaar Murray that where he had grown “musical” over the past few years (trying to compose like a Fifties songwriter, he said in a cryptic aside), he was done with it, and a wild stomp like “Big Boys” was closest that he’d come to the new sound he was looking for. He would use “Big Boys” as a roadmap, as his next album would be a protest record, Bowie said. Recorded May 1984, Le Studio, Morin-Heights, Quebec. Released as the B-side of “Blue Jean,” with the 12″ single having an extended remix by Arthur Baker. Performed live on the Glass Spider Tour. * These lines seem more Iggy’s, though “too much belief” and “your family is a football team” could just as well be Bowie’s. In an interview, Bowie claimed “this dot marks your location” as his, referencing a time when he was stuck indefinitely in an NYC hotel and was staring at the fire escape map. ** The sheet music has an A-10 chord. 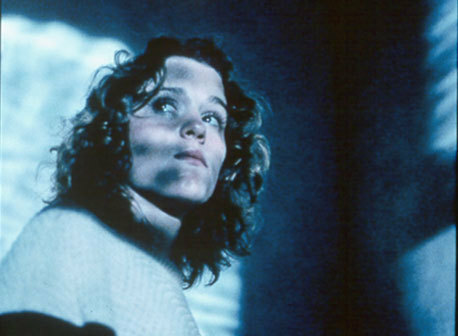 Top: Frances McDormand in Blood Simple (Coen/Coen, 1984). This entry was posted on Monday, December 5th, 2011 at 10:33 am and is filed under Tonight: 1984. You can follow any responses to this entry through the RSS 2.0 feed. Both comments and pings are currently closed. For me Dancing with the Big Boys and Blue Jean are the two best tracks on the LP (I’ll get to Loving the Alien later). After many years of not listening to this album at all I gave it a go (about three years ago) Played it really loud on some drunken summer night and Dancing with the Big Boys really jumped out at me. It’s bolshy, it’s brash and it has balls and also, as you’ve pointed out, some great lines to enjoy. Pity the whole LP wasn’t like this track. I’ll have to listen to the Arthur Baker remix – never heard that before. Actually I may give the whole LP another burl soon, on another drunken summer night. Twice in one decade hey? I really like the 12″ mix. As you said, it really lacks any melodicism but the production is really fun and very of its time. Fab, isn’t it? Air’s mix of “A Better Future” is my favourite remix of a Bowie song, but this, which I’ve never heard before, has to run it close. If Iggy and Bowie had come up with this 7 or 8 years before you can imagine that it might have sounded gritty, sinister and mysterious. As it is, the drums, backing vocals and horns give it that generic mid-eighties sheen and you wouldn’t be too surprised to find it as the “edgy” filler on a Phil Collins album or something. Possibly the best track on Tonight, although that’s not saying a great deal. And yeah, the remix is much better, just as eighties I guess, but in a good way. The Arthur Baker connection reminds me that it was perfectly possible for white guys with an art rock background to make good crossover dance music in the eighties (the New Order singles of around this time are pretty great). I agree that the cheap effects would probably have worked if they had gone all Art of Noise with it, now it just sounds like cheap effects meant to enliven a mind-numbingly dull track. The band sound like Huey Lewis and The News and why anyone in their right minds would use those backing singers is beyond me. There’s a couple of really great lines in there but that just isn’t enough to salvage the unspeakable horror that is this song. Never having heard any of this stuff before, I’ve been very reluctant to click on any of the links. This is the first time I plucked up the courage. I wish I hadn’t. Got as far as 2:46. Echo with considerable amplification everything Remco says. Except the bit about great lines. not too obvious, Phil—it escaped me, but you’re probably right. No, no, no! Please don’t pretend either version has any redeeming features. I listened to the 12″ b-side remix once in 1984 when I bought the single. Clicking on that link 27 years later, it sounds even worse than I remembered. I like Dancing with the Big Boys. Its the closest thing that comes close to channeling on the record. And that’s what makes a Bowie album so interesting -the channeling effect. Much of his music in the 80s sounded less channeled and more reconstructed and deliberate I think that’s what Tin Machine was used for -to reconnect with the channeling sound. One also wonders what other producers might have don. For example, the unlikely scenario: what would Mick Ronson have done with Tonight? His arrangements would have been impeccable and fantastic. This song has lots of marimba and by coincidence I find the songs I like the most on the album have marimba as well. This track, Blue Jean and Loving the Alien, seem to stand out that way. Its an instrument Bowie has never previously used on his tunes, and if this album sounded more like the later Tom Waits, it would have been more interesting, even with the exact same covers and tracks and dreaded Borneo Horns. I’m with the folks who think it’s one of the better tracks on the album (damning with faint praise, etc.) but I’m reminded of what Chris said about Tumble and Twirl, and the fact that you’re not sure if the musicians are in on the joke, or if they are playing it serious. That seems to be the case here. Unlike that great song “Fall in Love with Me”, where there’s a real sense of fun and careless abandon, this song misses that vibe entirely, and instead seems to be trying to be some kind of BIG IMPORTANT statement. That said, it’s still enjoyable to a Bowie fan like me who forgives the guy for just about anything. I’m very forgiving too and with a guy like Bowie with such a long and varied career his missteps become fascinating even though they can be crap. What I’d love to hear: Iggy’s version from early 90’s. Dancing with the big boys is a decent tune with some nice rock stomping and the dated 80’s effects its close to Bowie as he should have sounded. The lyrics are a bit silly in parts and the 12 inch is a good expansion of the fun and that’s the thing it is fun. This one would fit in better with NLMD. It has that tantalizing quality (for an obsessive, perhaps) that it sounds almost, kinda, like you could see how it might have been engaging… had a lot of things gone differently. It’s the only possible candidate for throwing a life-jacket, (aside from Alien and Blue Jean) from the shipwreck called Tonight. I’d still hesitate, but in the end, I’ll keep it as a reminder that DB wasn’t entirely dead inside during these sessions. I bought this album when it came out and before I’d even finished listening to the first side I’d gathered the impression that it had been cobbled together from half-finished and rejected outtakes from previous sessions. By the time I listened to this track, I was certain. It’s come as a surprise to me to learn that the album really was planned and executed as a coherent project in the orthodox manner. This particular track sounds to me like a brainstorming jam which potentially could have been a foundation upon which to construct a decent song (or even a section of a song during a more creative period) but nobody, least of all DB had the discipline, motivation or vision to turn it into something substantial. A big guitar sound is all very commendable but it should only be a component of a good track, not a substitute for one. Annnd Las Vegas Bowie closes the album with this dud. Not even Iggy can save this track. Your story of how the album came together (?) is intriguing. I recall reading recently about how Bowie had a very short attention span, but the fact that he discarded so much prepared material and just winged this is appalling and fascinating. I’m curious why this never happened even earlier in his career- we could have never had Station to Station and Bowie could’ve been remembered as the Glam God who ventured into plastic soul and petered out. It probably had much to do with his collaborators at the time keeping him in line, he really should have just swallowed his pride and brought Nile Rodgers back on for this album.